This post was originally published November 29, 2009–at the end of the 2009 NaNoWriMo. 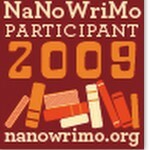 Debating whether to join NaNoWriMo this year? Read on! I suffered a crisis of confidence during this last week of NaNoWriMo (National Novel Writing Month, for the uninitiated). One week left to write–including Thanksgiving day–and I still had 18,000 words to go. Could I do it? Maybe. Was it worth it? I was starting to be less and less certain. I’ve been demanding a bit more of myself during this year’s event. I’ve been revising (a big no-no) and doing a fair bit of pre-writing, so that when I did write, the material was good. It’s been great for my page output—I’ve written far more than I would have otherwise—but with 18K to the finish line and far too few days to write them, revision and pre-writing would have to go by the wayside. Doubt attacked. Should I be pushing so hard? Am I neglecting family in order to meet a meaningless goal? Will I even be able to use the writing I’m producing? Time and again, reason told me to quit. Time and again, I kept plugging forward. I knew I probably couldn’t make it, but I couldn’t…quite…give up. You know those little motivational emails NaNo sends out every week to encourage writers forward? They really help. Encouragement isn’t a waste of time, but a way to refill my creative tank. When doubt attacks, just keep plugging forward. Experience shows that I’ll (eventually) come out on the other side. I’ve learned that if I practice long enough, even I—and avowed pen-and-paper gal—can learn to write first draft material on the keyboard. It’s much faster! Even when I feel like I’m writing useless schlock, it’s never long before the scene starts to come to life for me. Maybe I won’t be able to use this draft of the novel word for word, but through the practice of intense word production, I’ve made discoveries that will appear in the final draft. Over and over again. Reaching for an impossible-seeming goal stretches me in more ways than I ever expect. It’s led to a month of rediscovering what I value about writing—and rediscovering how to balance writing with the rest of my life. It’s also stretched my ability to write quickly, which is a valuable thing for any writer to learn to do. Even if I don’t write another word this month, I’ve already gained more than expected from this year’s NaNoWriMo. Sometimes, pushing yourself is the only way to discover what you’re capable of doing…and discovering your best is, I think, one of the keys to thriving on the writer’s road.